LONDON (Jan 31): Sterling steadied on Tuesday as investors awaited the start of a two-day debate in Britain's lower house of parliament over the triggering of formal negotiations that will take the country out of the European Union. 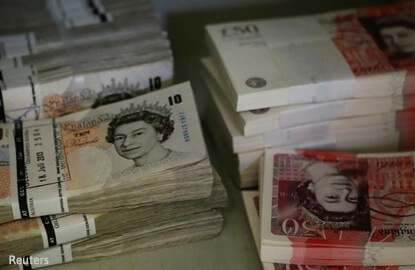 The pound was flat on the day around US$1.25, some way off last week's five-week high of US$1.2674. For the month, though, it was up around 1.4%, benefiting from a broad fall in the US dollar, leaving it on track for its first January rise agains the US dollar since 2012. British Prime Minister Theresa May's Brexit bill is expected to survive weeks of intense parliamentary scrutiny that begin in the House of Commons on Tuesday, despite pro-EU lawmakers' attempts to force the government to rethink its strategy. May's government is seeking approval for a law giving her the right to trigger Article 50 — the legal starting point for leaving the EU — after the Supreme Court ruled last week she could not take that decision unilaterally. It is expected to use its majority to resist any substantial amendments to the bill. "Even though lawmakers are overwhelmingly expected to vote for the bill in order for the government to proceed with triggering Article 50 by March-end as previously indicated, we will listen closely to the debate for any new signals regarding any negotiating objectives, as well as the priorities of the opposition parties," said IronFX analyst Charalambos Pissouros. Against the euro, the pound was flat at 85.67 pence. As well as the parliamentary Brexit debate, currency traders have their eyes on this week's Bank of England "Super Thursday", with the central bank expected to keep interest rates at their current record lows, but to increase its growth and inflation forecasts. "We stay of the view that sterling upside is limited and rallies should be sold," wrote Credit Agricole currency strategists in a research note. "This is especially true as long-term uncertainty with respect to Brexit should stay intact and as... (the) BoE monetary policy announcement and inflation report is unlikely to surprise on the hawkish side. This is regardless of BoE Governor Carney not long back having stressed that Brexit is not regarded as the primary downside risk to the economy any longer." Data released earlier on Tuesday showed Britain's consumers turned a little less gloomy in January, though there were signs that they might be starting to scale back on spending as last year's Brexit vote pushes up inflation. Britain's economy grew more strongly than its rich-country peers last year, confounding forecasts from the Bank of England and almost all private economists that the referendum decision to leave the European Union would quickly hit growth.